It's an easy attack. Register a domain that's like your target except for a typo. So it would be countrpane.com instead of counterpane.com, or mailcounterpane.com instead of mail.counterpane.com. Then, when someone mistypes an e-mail address to someone at that company and you receive it, just forward it on as if nothing happened. These are called "doppelganger domains." Some of the companies whose doppelganger domains have already been taken by entities in China included Cisco, Dell, HP, IBM, Intel, Yahoo and Manpower. For example, someone whose registration data suggests he’s in China registered kscisco.com, a doppelganger for ks.cisco.com. Another user who appeared to be in China registered nayahoo.com ­ a variant of the legitimate na.yahoo.com (a subdomain for Yahoo in Namibia). Companies can mitigate the issue by buying up any doppelganger domains that are still available for their company. But in the case of domains that may already have been purchased by outsiders, Kim recommends that companies configure their networks to block DNS and internal e-mails sent by employees that might get incorrectly addressed to the doppelganger domains. This won’t prevent someone from intercepting e-mail that outsiders send to the doppelganger domains, but at least it will cut down on the amount of e-mail the intruders might grab. I suppose you can buy up the most common typos, but there will always be ones you didn't think about -- especially if you use a lot of subdomains. Beware the TLD typos too: "example.cm"
As I wrote on my blog, what about ordinary CIA-triad protection using PKI/SSL for both integrity and confidentiality? There's another (partial) defence that's also a big win for usability: set up proper internal address autocompletion via LDAP or MS Exchange to reduce the incidence of typographical errors. Also use LDAP or AD lookup on intranet sites rather than hardcoding email addresses. When I first got into reading security sites some years ago I wanted to go to Wilders. Encouraging and promoting end-to-end email encryption immediately came to my mind as a possible measure against this threat. Apart from this interesting attack application, the general problem of typosquatting isn't really new, anyway. Another defense would be legal action based on trademark laws (depending on jurisdiction - in Germany, you would have excellent chances when suing countrpane.de, if you had counterpane as a trademark here). It doesn't seem like it would be that hard to implement a filter at the SMTP server to check a dictionary of common typos in domain names, and block accordingly. And the technique can be used with bit squatting, rather than typo squatting - register domains that are 1 bit error away from the target. Though typo squatting is more productive, bit squatting may not get noticed at all, especially if the error is corrected in the outgoing mail. "only two senders indicated they were aware of the mistake." And an unknown number of others that sent the followup/resend to the real address. so if your an org add a com to your name and do an NSLOOKUP, U might be surprised! This really sounds like a problem which can be fixed with better user interfaces. It sure is a good thing that domain registrars have no liability for handing out domain registrations obviously intended for use in fraudulent enterprises. The need to vet names against existing ones would cut into their cash flow. I would imagine there would be a way to flag emails when not addressed directly to the target (i.e., forwarded, redirected, etc). I can think of a simple rule in outlook to move it to another folder (I realize this is more complicated on larger systems, but the concept is the same). I'm not skilled at web dev, but there may be a way to tell when a web visitor is redirected. I'm not sure. I can see the anti-malware and web security products picking up on typosquatted sites in the future, particularly if the fiscal risks become substantial enough. Wouldn't encryption help? To me as a layperson, this actually seems like an area where it would. @HJohn: "I can think of a simple rule in outlook to move it [forwared email] to another folder"
The problem is that your simple rule relies on mail headers that are inserted by well-behaving clients. Malicious forwarders would simply omit these headers. For web-sites this would be solved using the HTTPS everywhere infrastructure with a memory of certificates. For email, maybe start to define (use) smtps and imaps (smtp and imap over ssl) with public key encryption. And then the common check of certificates, just like ssh passphrases. Obviously, that would mean a background email exchange to get the public keys+certificates of every new email destination. I've read this stuff a week ago on another news outlet and my reaction is still the same: Security can't protect you from being stupid. Buying or monitoring such domains isn't the solution. The big problem is that as the *recipient* of the mail, there's very little you can do. You have no control over the sender. If the sender is going to send TOP SEKRIT information in the clear and typos the domain, you're screwed. End-to-end encryption only works if, as a rule, you reject all unencrypted mail. You need to train your senders that you *only* accept encrypted email. You can't even accept low-importance mail unencrypted. If you accept any unencrypted email, eventually someone's going to mess up and send you that confidential document in the clear. You're training a puppy not to piddle on the rug. You can't say, "Well, it's okay if there's not very much piddle." Detect and reject forwarded mail? Even if technically possible (and I rather doubt that's the case) that only partially mitigates the problem. The best it can do is to detect that you've already been compromised. The MITM already has the mail that was being sent to you. Why not just combine user awareness with lazyness to fight this issue? Who types am email address or URL? Ctrl-v was invented some years ago and easily combats this problem. Who types an email address or URL? Ctrl-v was invented some years ago and easily combats this problem. 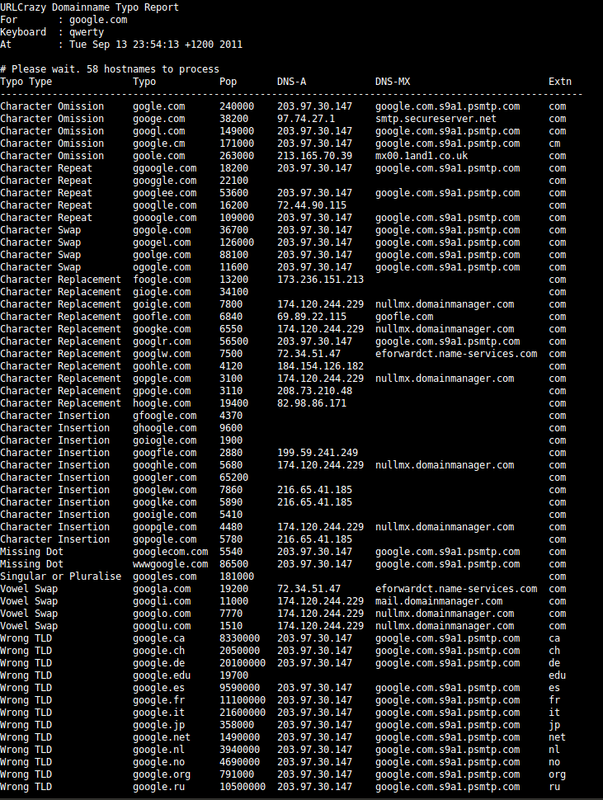 Another internal defense - make your company's DNS servers authoritative for these 'near domains' and set their A and MX records to 127.0.0.1 so anyone sending mail to them will be bounced. We're all stupid at some time or other. If we're lucky, that stupidity doesn't cost too much. The goal of good human-interface and systems design is to increase the scope of that luck. @Brian: Could even setup an internal mailserver to take these emails and bounce with a nastygram, CC'ing the offender's manager. I'm sure that'd fix the problem right quick. Oddly, I'm experiencing something very similar, but in reverse -- someone else picked a domain that has resulted in their email being sent to me. My primary domain starts with QU while the other person picked a domain that's identical to mine, except without the U in it. Since for English speakers it's nearly reflex for the Q to be followed by a U, I've received quite a large volume of misdirected mail. It's a music venue, and I'm always receiving requests for bookings, tickets, parties, and in one case an interview with the BBC. I had my domain for a decade before they picked theirs, though, so they've done this to themselves. Since I have no intention of spying, and really would prefer to cut down on the spam, it's a lot more obnoxious than beneficial for me, too. Another fun aspect is that if you use a mail program with autocomplete, if you type something wrong once, it will be suggested to you forever and ever afterward if you start typing the address again. Encryption is not a practical solution for recipients, as it is the sender that is required to do the encryption. If your company has a few business partners that regularly email your company’s users, you may be able to convince them to only send encrypted emails, but there is no way you can convince every person who may email your company to encrypt their messages. Furthermore, even if you could get everyone to encrypt their emails to your company, typical PKI email encryption setups would fail. When the sender went to send a message, their client would look up the public key of the recipient (theoretically your company) and encrypt the message with that. However, if they incorrectly address the email to a squatter domain, the public key lookup is also going to be done to that domain and then all that has been accomplished is encrypting the email that the squatter gets with a key he has. The only practical solution that comes to my mind is for someone (either the registrar, your company, ISPs, etc.) to proactively check domain names that are clearly squatters and either block email delivery to them or take control of the domain. I'm actually really surprised that this was so successful. ... ah, mobile devices. Yes. Typing email addresses on mobile devices. I bet that's the culprit for the lion's share. @Pat Calahan: Won't work if the first time the address is entered, it's wrong. Simplified email addresses would be partial defence against this. The only way encryption could truly help is if the mail server will only allow encrypted email to go out. If you have a pub key for John@sub.foo.com, but type John@subfoo.com, your email client and server are not going to encrypt the email for the second address. So it will either be rejected if you block outgoing plaintext, or it will get through. If you block outgoing plain text emails, then it will be very hard to send an email to a new but intended party, such as sales@technicalresource.tld. Imagine what the smartphone using executive will say when it takes him a few days to set up communications with a new contact. Spell check like functionality mIght help, but a look at auto correct snafus doesn't leave me with much hope. The attacker's forwarding server has a different IP address than the regular clients, so maybe with some analysis it's visible in the logs of the web server. I saw a doppelganger domain used recently in a "Your package has arrived" spam email. The URL of the tracking link was something like www-appsups.com instead of www-apps.ups.com. Even if you've trained your users to hover and check out the links, it takes a pretty close eye to catch that when it's just part of a long URL with many parameters. Oh, sure. I was just surprised that the "first time the address was typed it was typed wrong" led to so many mis-addressed emails. When's the last time you typed an email address for the first time? Things get in my address book from different venues than "me typing them". But then I thought of the mobile device. Which doesn't have the same address book as the primary email client, perhaps. I've experienced a similar issue with email addresses. For example, my GMail address is simply my last name @gmail.com. On occasion, I've intercepted email meant for others with my last name, presumably distant relatives, sent to them by others who forgot to add a first name either through omission or mail server failure. I've gotten addresses, site passwords, personal information, etc. I've done the responsible thing by informing everyone involved and deleting the emails from my account. However, I assume that puts me in the minority. I wonder who else out there might register similar email addresses for more nefarious reasons. I type email addresses quite a lot. I had no idea this was (apparently) so unusual. "I type email addresses quite a lot. I had no idea this was (apparently) so unusual." It's not that unusual, but it's getting rarer by the day, for the same reason people "Don't know phone numbers" any longer (and this also has a significant personal security/safety issue as well). When I was a youngster microprocessors had not been invented and computers that were of any use consumed as much electricity on average as a hundred or so homes. By the time I left school you could if you used a month or so's take home pay buy an 8bit micro with less than 1K of memory. Buy the time I'd finished my "formal education" as an engineer I'd built several computers and owned what was reconisable as a business personal computer and several home computers. All this while telephones (in most parts of the world) still had rotary dialers, although DTMF had been around a while. However "deregulation" saw a change in that and "cordless phones" came along, these realy needed microprocessors to work and it was thus easy to add "dialer memory". It was the introduction of dialer memory that ment that people need not remember seven digit numbers and area dialing codes any longer, they just hit "recal 1" for "Aunt Bessie" and "recal 2" for "Uncle Bill" etc. It's progressed to the point with modern mobile/smart phones where now all you need to do is say "call aunt Bessie" and you don't get to see the number at all. A fix could be made in the client, the browser could warn the user that this site is not know before sending credentials to them. When a user starts a realation ship with a new site it usually begins with a registration form, so if the user is sending login information to a site that he has never interacted before this could be a redflag. To make the false positive less troublesome, the browser could also check if the domain is similar to another site that the users usually uses. This is a UI problem. Like all UI problems, you can't fix it at the backend (when the problem's really in the human). Given the problem is how bad humans are at string-matching - nayahoo.com/na.yahoo.com - not to mention Unicode character substitution! - perhaps we need to change the problem domain. I've seen a couple of sites on the 'net that take an arbitrary chunk of data, hash it, and then use the hash to generate a picture. If our email clients generated 'pictures' for our mail recipients, then the problem becomes one of picture recognition (easy for humans) rather than string matching (not so easy). I sent you my thoughts on this subject by email to bruce@schnier.com. The other 2LDs have similar restraints. In case that's not enough there's a specific separate policy on typosquatting (misspellings). h) any other name that auDA determines is a deliberate misspelling, having regard to the surrounding circumstances. I really like the auDA for this and a few other things. In nearly every email client, if you highlight the incorrect suggested name in the dropdown and press delete it removes it from the autocomplete list permanently. One of the exceptionally useful little tips that are never part of any formal training or tutorials of office suites. This is not down to UI or user training issues. It is purely an isue of accidental data loss - and your DLP system should block and alert you about the mail so you can verify the recipients. The DLP solution we have can be configured to detect e-mails with candidate addresses to doppleganger domains. This will pick up most avenues of this attack. The vendor released this feature within 1 week of the paper being released. Nice...!